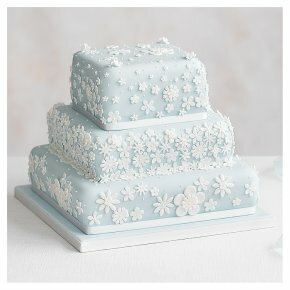 This beautiful floral wedding cake is covered in pastel blue sugar paste icing and intricately hand decorated with edible white blossom. Hand finished with white ribbon.This 3 Tier cake is available in 8 choices. Remove ribbons before serving. Filling Choice: Consists of a bottom tier of rich dark fruit cake, covered with a layer of marzipan , a middle layer of golden sponge with raspberry jam and vanilla buttercream and a top tier of chocolate sponge with salted caramel buttercream and caramel sauce.